That contains ready made symbols for a wide range of components and which can be simulated. Many of these?components have optional US and EU style symbols, we split them, so you can select those you like. Click on the drop down list or right click to popup the context menu, it contains many packages or parameters. EasyEDA will remember your choices for the next time. EasyEDA provide a lot of libraries, you can find them at “left-hand panel - Libraries”, hotley “SHIFT+F”, at here you can search library from LCSC, system, user contributed. SCH Libs: Schematic libraries, including spice symbols. 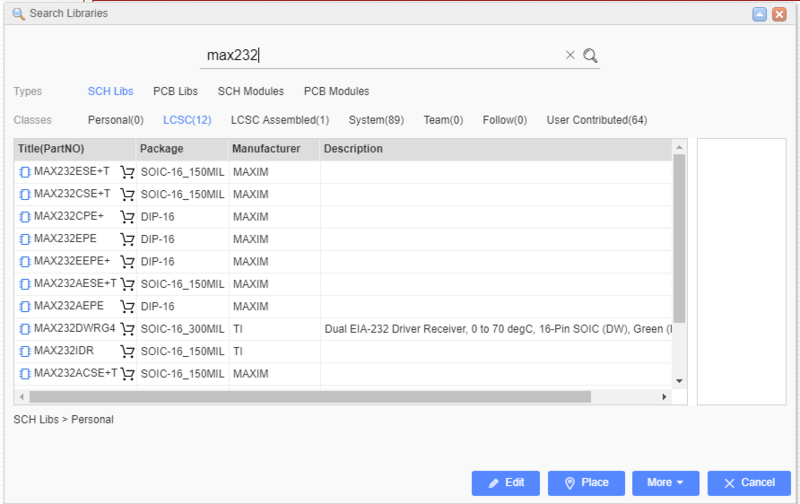 PCB Libs: PCB libraries, you can treat them is package, footprint, pattern. SCH Modules: Schematic modules, a part of the circuit design. It can not assign the PCB module. when it placed on the schematic, it will be separated. We add an LCSC Assembly Components option of the Parts, It’s easy to choose which component can be assembled by LCSC. Yes, We will provide the assembly service. Simply type your part number or symbol’s name to Search. before searching, you must choose the “Type” first. and then click the “Table of contents” to open the categories list to choose your components. From there you can scroll up and down to browse parts from each category. 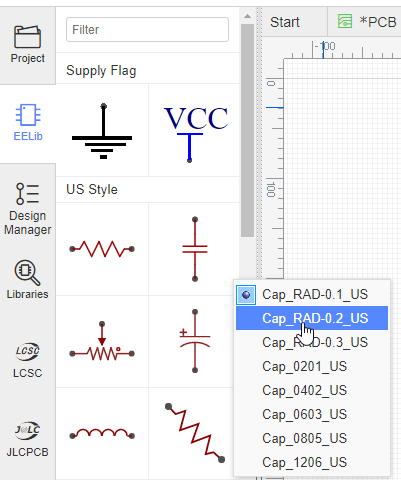 When you hover the mouse over the picture of the Schematic symbol or PCB footprint, you will find a toolbar with “Edit”, “Place”, “More” buttons. For parts you use infrequently,?you don’t need to Favorite them; just Place it into your canvas directly. Or you can double click the library to place. EasyEDA supports multi-documents so please make sure that you are placing the part into the right (active) document. The active document is the one with the highlighted tab. You can’t place a Schematic symbol into a PCB file, or a PCB Footprint into a schematic. If you want to create your own version of a symbol or footprint then you can open an existing part from the library to use as a template, edit it and then save it to your local Personal?library in Libraries of the Navigation Panel. 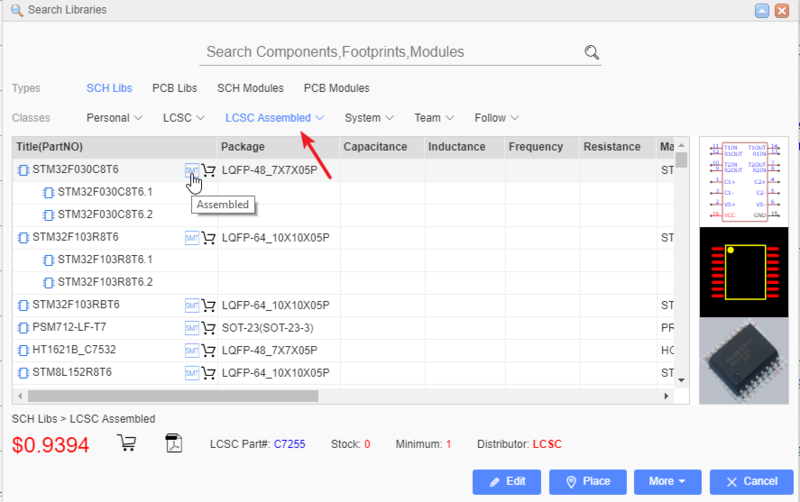 We can’t promise that every component in the library is free of errors so please check all symbols and footprints carefully before you commit to a PCB order. If you do find a mistake in a?component, please use the Report Error, so that we can?fix it. Components with sub parts (multi-device packages). When you find a component with sub-parts, you can’t Place or Edit it, but you can Favorite and Clone it as your own part, which you can then edit. Every library when you click, you can check its preview image, such as SchematicLib, footprint, production picture. Click the the image you can open it quickly. Find the component which you plan to place to your schematic at “Libraries”, then move your mouse to the canvas and left click. If you want to add more, just left click again. To end the current sequence of placements, right click once or press ESC. Don’t try to Drag and Drop a component to the canvas:?EasyEDA team thinks that Click-Click to place components will be easier to use than a Click-Drag mode. The number?of pins on some components can be quite large. That’s why it’s easier to divide such a component into several parts or functional blocks. 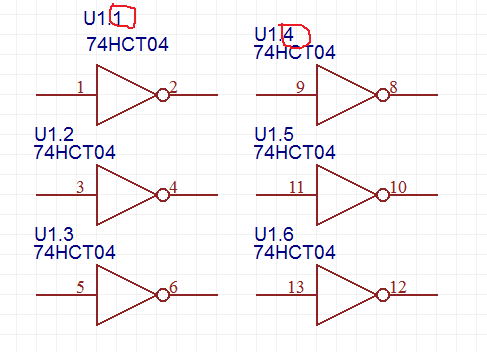 As a simple?example, there are six gates in the 74HC04?Hex Inverter component. To avoid clutter in the schematic, GND and VCC pins of such components are usually served?by a separate part of the component. This is really convenient as it doesn’t interfere the working process with logical parts. The NetLabel names of VCC and GND Pin are usually hidden. When placing the 74HC04 on a schematic, it will look like the screenshot below. Note: The component Prefix will be in form of: U?.1, U?.2 etc. How many times?have you hit a schematic capture roadblock because you couldn’t find a?component symbol? 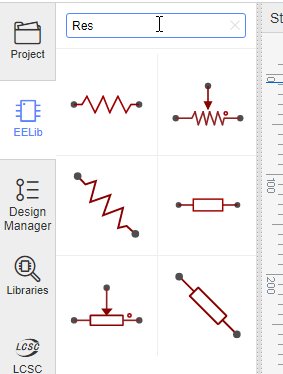 Well, in EasyEDA that would be never because?the Schematic Library Wizard?provides a quick and easy?way to create?a general?schematic library symbol.? The Schematic Library Wizard…?command can be found in the top toolbar. Or Edit > Schematic Library Wizard in a new schematic lib document.